Why Have Our Dear American Golden Retrievers Become Cancer Time Bombs? It's not hard to see why Golden Retrievers are among the most popular breeds in the U.S. year in and year out. They're cuddly cute as puppies and beautiful as adults. They're great around kids, energetic, intelligent, intensely loyal and easy to train. In fact, they often train their owners. But American golden retrievers are also are ticking time bombs. An extraordinary six of every 10 Goldens succumb to cancer well before living to the once typical 12- to 16-year life expectancy. The mortality rate for other dog breeds, as well as for humans, is three in 10. This post has become somewhat of a Wailing Wall for people who have lost their Goldens. Some 73 of them have shared stories of their losses as of this date. The average age of these dogs is 8.4 years. The outlines of the Golden epidemic have been clear for over 10 years, but organizations like the Golden Retriever Club of America (GRCA), while on the one hand funding studies on and supporting research into the cancers, have done little or nothing to rein in greedy member breeders who play God in knowingly selling interbred, cancer-prone puppies to unsuspecting buyers who end up heartbroken. Their rationale, in so many words, is that it's not their job. The GRCA's homepage contains no mention of the epidemic and the association has not updated its National Health Survey of the breed since 1999. The GRCA has gone so far as to recommend that owners give their Goldens a regular regimen of a drug that has been shown to inhibit cancers, which is not unlike a car manufacturer recommending that drivers wear crash helmets when using vehicles that it knows cause an inordinate number of fatal accidents. Meanwhile, it would seem to stand to reason that if breeders only bred Goldens whose parents were long-lived, progress could be made against the epidemic. Alas, many breeders seem to be in the business only for the money and have little interest in improving the breed. No surprise there. Purebred Golden pups can fetch upwards of $2,500 and the alternative to selling dogs with shortened life expectancies is to stop selling them. Period. And while the canine genome has been successfully sequenced, the fine print of the genetics of Goldens and their cancers is still not understood well enough to hold out hope for Goldens less vulnerable to cancer in the foreseeable future. I know of the Golden Retriever cancer epidemic all too well. 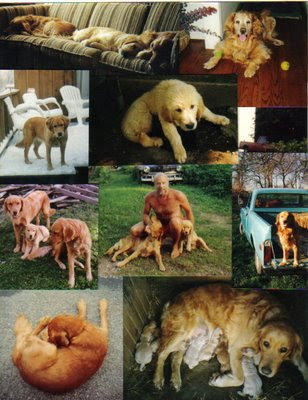 I have lived with and been acquainted with a dozen or so goldens over the years. I have midwifed their births, taken them to the vets, helped breed them and cradled them in my arms as they drew their last breaths. It's hard to name favorites, but Ruffie (Medford Ben's Ruffles was the snooty name on her pedigree papers) would have to be at the top of my list. Ruffie was special from the time she opened her tiny eyes. While she played with her litter mates, there was an unpuppy-like serenity about her which grew deeper as she matured. She in turn seemed to impart a Zen-like quality on her own offspring, who included Cody, the companion of a good friend, and a sweetheart by the name of Luna.But despite careful attention to their diets, plenty of exercise, regular visits to a terrific vet and the love and devotion of their owners, Ruffie departed this world well before her time, a victim of lymphoma (cancer of the lymphatic system) at age five, while Luna died at age three, also of lymphoma. Cody, meanwhile, lived to the relatively ripe old age of 11 before succumbing to hemangiosarcoma (cancer of the blood). While hemangiosarcoma and lymphoma are the leading killers of Goldens, the breed also is at increased risk for osteosarcoma (cancer of the bones) and immune system diseases -- primarily allergies and hypothyroidism -- that can comprise their ability to destroy abnormal cells before they can cause cancer. In fact, it may be that the first litter of founder dog Goldens -- a cross between a registered Tweed Water Spaniel and unregistered yellow flat-coated retriever bred in 1865 by a Scottish land baron who was seeking a superior sporting dog -- carried genes that have led to widespread immune system dysfunction in the breed. All purebred dogs are technically interbred, but as Rhonda Hovan, an Ohio breeder and health and genetics writer puts it, Goldens may have a very similar inherited "germ line" that put them at greater risk. "One gets cancer, another becomes hypothyroid, another gets lots of hot spots, and another has food allergies -- but the underlying genes that put them at risk for cancer and which are passed on to the next generation, may be very similar," Hovan explains. This situation is further complicated because cancers usually don't appear until after a Golden is no longer bred but has passed on its genes to multiple puppies. There is little that Golden owners can do to detect cancers in their dogs and they often are too advanced to treat when discovered, although there have been strides in treating the cancers with Palladia, the first FDA-approved cancer drug for dogs, as well as some of the same chemotherapy drugs used in humans. Such treatments can be quite expensive, $26,000 in the instance of one owner who managed to prolong her Golden's life by only a few months, while some pet health insurance policies have cancer riders that do not cover hereditary conditions. There are some early warning signs. These include lumps or masses on or under the skin, vomiting, diarrhea, lethargy, difficulty in breathing and changes in eating habits, but many Goldens seem fine one minute and are deathly ill or dead the next. Hovan had a Golden who had hiked 8,000 miles by her side and died of hemangiosarcoma. "As experienced as I am," Hovan said, "I didn't know until 12 hours before she passed away." As with humans, lifestyle can make a difference. Studies show that dogs that are lean and fit have a lower risk of cancer, as well as other health problems, but there is no evidence that exotic diets make a difference. Not much of a defense in the face of an unrelenting epidemic without end. "Pedigree Dogs Exposed," a BBC One documentary first aired on August 19, 2008; "When Cancer Comes With a Pedigree" by Melinda Beck, The Wall Street Journal (May 4, 2010); Winning Cancer Fight: No Longer Automatic Death Verdict Thanks To Advances" by Amy Sacks, New York Daily News (November 14, 2009); "Understanding Cancer In Golden Retrievers" by Rhonda Hovan; Email interview by the author with Hovan.